More than 90% of SLE patients will experience joint and/or muscle pain at some time during their illness. I have a pimp cane. I am 30 and I have a pimp cane- a leopard-print cane that helps me get around and with STYLE. I know there are many in my position…. too young to be using a mobility aid. I tried to research stats regarding how many of us are out there but could not find anything, but that does not mean it is of insignificance prevalence. In addition to my muscle and joint pains, Dr. Lupus has the pleasure of treating my muscle weakness (the fancy term- myositis). Somedays, my legs will pass a message to me that they are on break (or on occassions go on strike), giving me the impression that I am too heavy for them (On the real: I am not going to deny that I have put on a couple of pounds since the initiaion of my steroid therapy and the lack of movement caused by pain and weakness does not make me any skinnier… as I eat a full plate of tex-mex in my bed). BUT how dare my legs suggest that I am toooooo overweight! 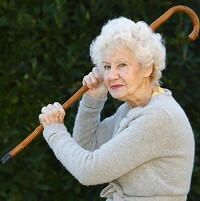 It is on these days that I pop in a Mintos (I substitute Mintos with Vicodin) and look to my trusty cane. As soon as I grip onto that handle, something comes over me. It is like I gain super powers and a new attitude- an attitude beyond my typical diva-ish ways-one that is similar to the famous character Dr. House. For those who have never heard of this fictional character- shame on you! This character paralells the greatness of Sherlock Holmes. I’m not going to rant about House, as I am pretty sure there is a blog dedicated to the show and the character (now I am curious to know… let me know if you find one). Here is the point of this blog, I turn into a Vicodin-, steroid-, meloxicam-popping, bitter, moody curmudgeon with a triple dose of wittiness when holding my walking cane (aka pimp stick). But, honey, why are you so bitter when using the cane (you may ask)? Here’s my answer: Because I am in pain and I can 🙂 . 5. Poking people to get their attention instead of using your voice. 4. Sitting on a park bench and enjoying the day while tripping joggers. 3. 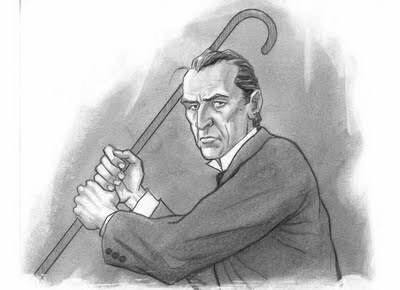 Shaking cane angrily and possibly yelling “You wipper-snapper!”- this is an ultimate form of expression.